Our friend Dave Pence (a.k.a. Steve Spence, dieseldave) sent me a postcard once, a long time ago, of a building disaster: the ice-encrusted, still-smoldering ruin of a three-story opera house. It was unidentified and un-postmarked, but it was also a perfect fit for the sort of center-city disaster that might have made way for the 1914 Carnegie era public library I had imagined for Agincourt. Years later, while engaged in my usual routine survey of the overnight postcard listings on that unnamed on-line auction site, what should appear but another view—another real photo image—of precisely the same urban fire, only this time it was identified as Keokuk, Iowa. And it was dated, so that I could search elsewhere for information on the event. While I’m sorry for the loss of property, I’m grateful for the sort of accident that isn’t so much “sow’s ear becomes silk purse” as it is making lemonade when someone drops a bag of lemons in your lap. 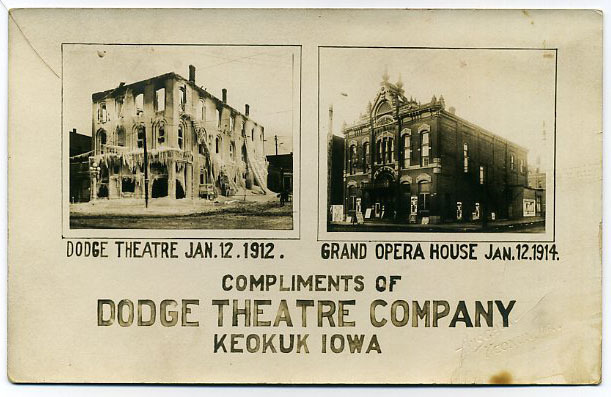 I’m not exactly sure what the card above (which shows the Dodge Theatre disaster) is all about. But it’s currently on auction, though at a price I can ill afford. It would be a nice addition to the collection, but posting it here may be enough. 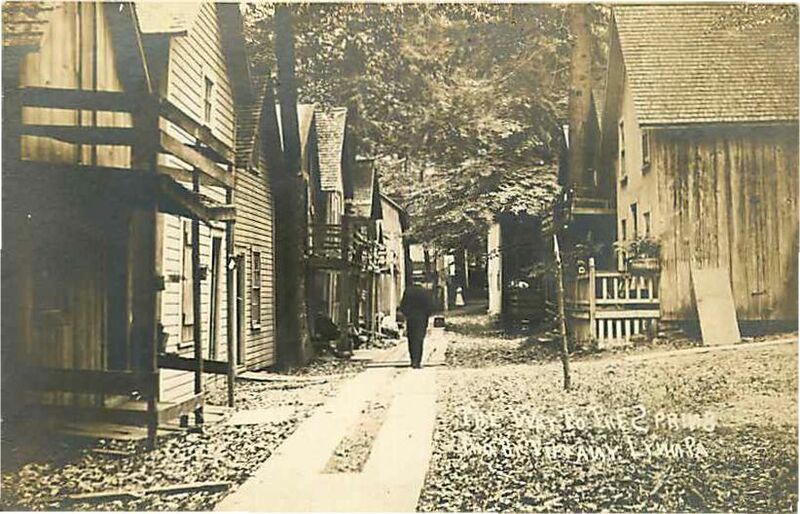 Early in its history Bedford Park was a company town. It was sited, designed, and built for middle-management employees of the Corn Products Company, a food processor formed in 1906 by the merger of several smaller companies. Think of it as the International Harvester of corn. That merger brought my grandfather to Chicago from his old home in Southern Indiana to work in the new Argo Plant of CPC, and that was where he met Clara Markeiwicz. They married and had a son, Roy, about the time they moved into a modest two-bedroom home at 7727 West 65th Place. Bedford (as most of us called it who grew up there) was too small for its own elementary school, so Roy went to Argo School, a fifteen minute walk from home. [Some have found it fitting that I graduated from Argo High School; that, in effect, I moved from Argo to Fargo. I don’t see the humor.] But Argo and Bedford Park were separated by a busy set of railroad tracks, so each school day my grandmother took her son—her only child—to school and each afternoon she picked him up. One fateful day, with a load of laundry unfinished, she lost track of time and failed to be there when the school day was over. Kids being who they are in most times and various places, Roy ambled toward home just as a freight train crossed his path. I never asked whether it was his idea or a dare from someone else, but he ran beside the train, grabbed the metal rungs on the side of a boxcar, and took a short ride on the shifting car. Letting go, he swung under the car where the wheel ran across his leg, just below the knee. By the time Clara got to the scene, a crowd had formed as her son was carried to a nearby doctor’s office. I’ve never known the details; I never asked and now it’s too late. What I do know is that the infected wound developed gangrene, a nasty infection that required more of my father’s leg to be whittled away inch by inch until the knee was gone and all that remained was the stump of a hip. Roy became a teenager; a growing boy in a household unable to fit him with an artificial limb that might keep pace with his physical development. So Roy’s grade- and some of his high school years were spent on crutches. Nature, of course, stepped in. Compensated. Gave him astounding upper body strength. Which combined with a developing self-sufficiency to create the man I knew as father. There is more to the story, much more, but for the time being it’s enough to make this small point: it isn’t easy to tell which is the wrong side of the tracks. In fact, it may not be the side but the act of crossing, itself. 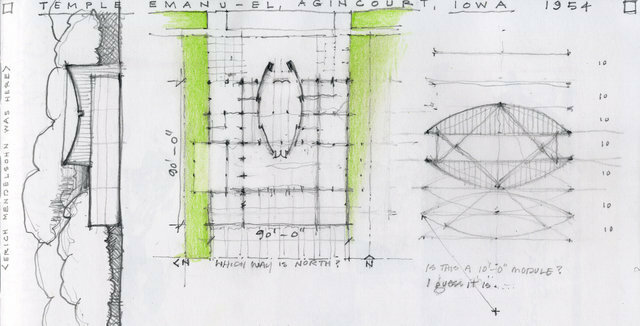 All of Agincourt’s original townsite—all of its solitary square mile—is tightly wedged in the right-angled intersection between Crispin Creek and the mighty Muskrat River. And the Milwaukee Road railway right-of-way clings so close to the creek that boundaries between haves and have-nots aren’t so obvious. Each of Agincourt’s four quadrants is a mirror image of the others. But each developed its own profile. And the quarter where my family are likely to have lived was the southwest quad, often called “The Flats” or “The Hollow”, because of its tendency to flood each spring. It isn’t easy to design the un-designed; to plan the random, because, of course, it isn’t—random, that is. Then I saw this postcard and thought it might be The Hollow. Could an entire neighborhood grow from such an image? I think so. 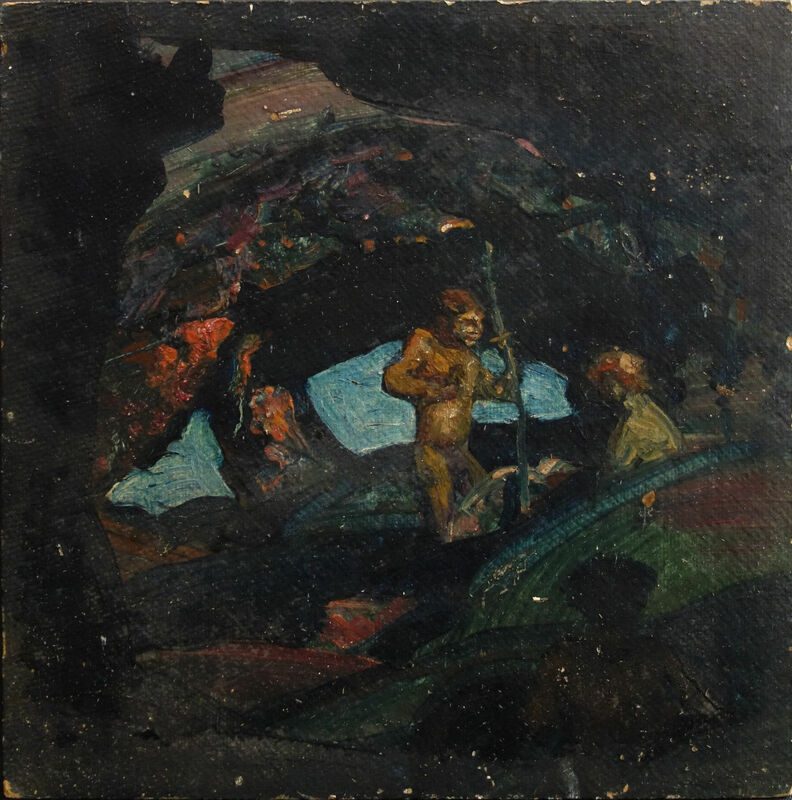 Pennsylvania is disproportionately represented in the Community Collection, especially by artists who had attended the Pennsylvania Academy of Fine Art or come under its influence. 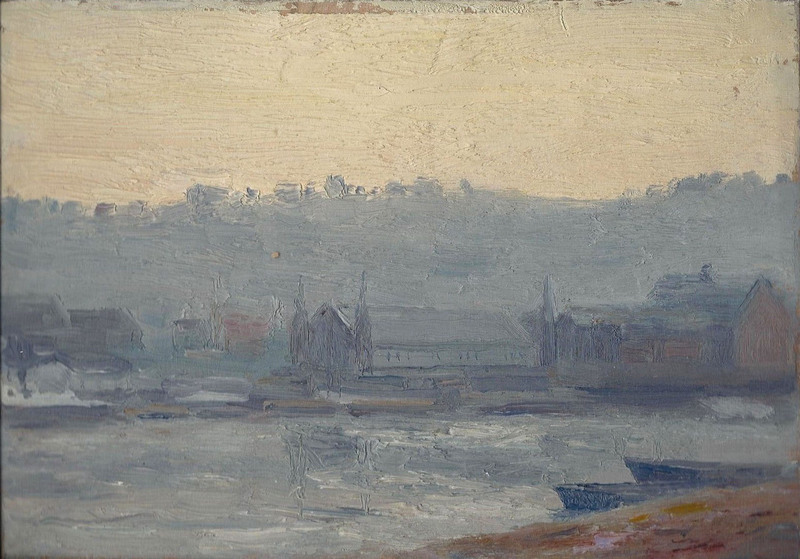 Ira Smith’s depiction of “The Schuylkill” falls within the movement called American Impressionism, which probably places this small undated work in the early years of the 20th century. The painting shows a factory and other riverside establishments along the banks of the Schuylkill River near the western edge of Philadelphia. Unlike the Delaware on Philly’s eastern edge, which accommodates ocean-going ships, the small Schuylkill reached inland as a transportation artery for coal and other commercial transport to Philadelphia’s hinterlands. The work was part of the modest collection of the Tennant family, founded by Gaudeamus Tennant after his emigration from the Channel Islands to New Jersey in the 1790s. Two of his grandsons, Horace and Virgil Tennant [their middle brother Pliny Tennant disappeared into the gold fields of California], were among the founders of Agincourt in 1853. Waugh was born in New Jersey, son of a portrait painter, and was fortunate enough to study at the Pennsylvania Academy of Fine Art during 1880-1883 with Thomas Eakins. Waugh also studied in Paris (in the Académie Julian), then lived in the Channel Islands and Maine before settling at Montclair, New Jersey. He is known primarily as a painter of seascapes. Some of Eakins’s American iconoclasm can be seen in Waugh’s bold composition, but the moody color scheme and the contrast of light and dark are more typical in the work of Albert Pinkham Ryder, another Philadelphia influence. This was a recent anonymous gift to the Community Collection in memory of Seamus Tierney, theater director, whose last production “Medea” was inspired by Martha Graham’s ballet “The Cave of the Heart.” Tierney died in 2011. In the geographic center of the state of Illinois, there is a town called Normal. Do you suppose that everyone living there is? Friends may pool their resources for a one-way bus ticket, hoping that Normal would work its magic and make me normal, too, though I think there’s little chance of normalization at this point in my life. So save your money. Normal takes its name from a state institution there, a teacher-training school that not only gives its name to the city, but also to an entire species of higher education. I was surprised to learn that it derives from French higher education, the École Normale, that fulfilled a similar function in their culture. Like Minnesota State University Moorhead (a.k.a. Moorhead State) which was founded as the Moorhead Normal School, North Dakota created several in response to our settlement patterns—east to west—establishing Mayville and Valley City as “normal” schools, and then Minot and Dickinson as the center of state population shifted westward at the time of the First World War. 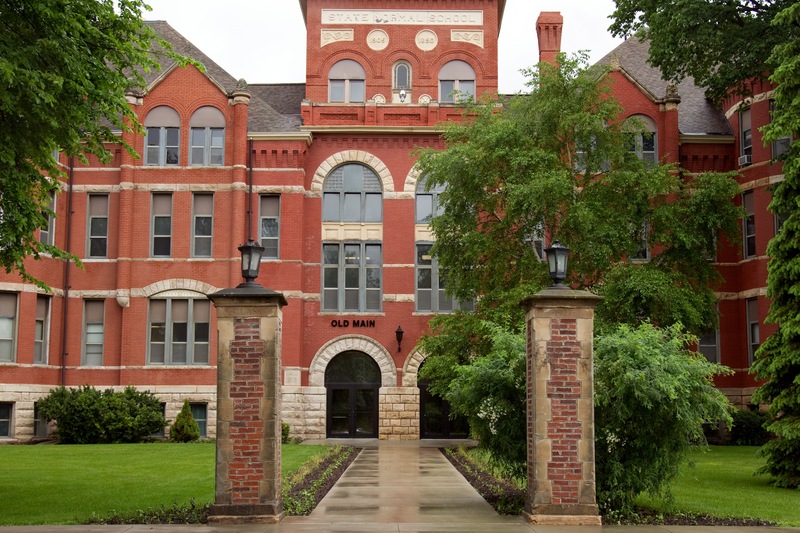 Given Agincourt’s date of settlement and incorporation (1853 and 1857) and its growth through the late 19th and into the early 20th centuries, it seemed natural—normal, even—to imagine that it, too, enjoyed the presence of a teacher-training school, Northwest Iowa Normal School (a.k.a. NIN). Somewhere, here in this blog or elsewhere in the Agincourt project files, there’s a piece that our friend Howard Tabor wrote about the origins of the school: that a closed 19th century county-run orphanage (these were quite common across the Midwest) found a second life as a teacher-training institute created by the legislature in Des Moines in response to a delegation of community leaders. What better argument than a recently disused building which might be put to better purpose! So far, so good, until last week’s issue of the High Plains Reader, Fargo-Moorhead’s alternate press. I wrote a few entries ago about a rumor afoot in architectural education: that graduation from an accredited program in architecture will be the equivalent of professional licensure. Who is promoting this notion and what their motivation might be aren’t clear. But the implication is obvious: education will inevitably teach to the test. Whether administered by the school itself or the state licensing agency, what reason could there possibly be to do reach beyond what is traditionally covered by the A.R.E. (Architectural Registration Examination)? There’s the remote possibility, I suppose, that the exam itself could become more speculative, more expansive. Let’s hope. M. Wayne Alexander, an HPR contributor and faculty member at MSUM, wrote a column recently about educational fads, many of which we’ve seen at NDSU in the last forty years. I recall our own department’s response to the initiative several years ago called “the extended day,” the notion being that an adult out-of-school population might be lured back to classrooms by extending university class offerings to nine or ten o’clock. The Business College still does—probably always did—but why not the rest of the campus? Our spin on the “extended day” wasn’t well received. If the rationale was better use of the physical plant (classrooms, laboratories, libraries, etc. ), why not the extended year? At that point we were on the quarter system—fall, winter, and spring—but there was still that pesky Summer Session. Get it? Semester—semester—semester—session. Why not treat the summer as a full-blown, legitimate semester, ten weeks in length like the “other” three? The implications for an architecture curriculum were frightening. Students could choose which of the four semesters would be their “vacation”. In theory, they could continue non-stop throughout the year and finish the five-year program in four years. Faculty would also achieve some flexibility in “time off”. Of course, the “regularity” of course offerings would be sketchy, at best, but it seemed worth the exploration. Well, you can imagine how quickly that was shot down. So today’s bottom line is a question about the history of Northwest Iowa Normal. The place should be getting ready for its centennial. How has it fared, do you suppose? What educational fads have come and gone and come round again in slightly altered form? As American culture devolves into downright tribal behavior, human tragedy tends to be seen in one of two ways: a) dropping everything in order to help or b) shrugging it off with the observation that “they brought it on themselves.” Or when a plane crash and the deaths of more than two hundred and fifty people is seized as an opportunity to criticize a president unconnected with the event. I was reminded of a story told by my old friend Bonnie Lou Naifeh, who once worked as a public librarian. Bonnie was then married to a fellow architecture student at the University of Oklahoma, Skip Hill. Bonnie worked at the Bethany Public Library in the western suburbs of Oklahoma City, a forty-five minute drive from the O.U. campus in Norman. She came home one day distraught from an encounter with one of the library patrons. Bethany, you should know, is also the home of multiple conservative Christian colleges and is itself an exceptionally conservative community. This was the 1960s, though, so we should not have been surprised when Bonnie was chastened by library staff for the length of her skirts or her use of makeup. But the job was in a public library. On the day in question, Bonnie had staffed the check-out desk and was stamping books and sound recordings of one patron. Since one item was a recording of American opera singer Beverly Sills, Bonnie offered some conversation to the patron. Coincidentally, Miss Sills had been a guest on the late-night variety show of Johnny Carson, the “Tonight Show” in its third incarnation. Among other things Carson had discussed with Sills the difficult topic of her daughter, who was born profoundly deaf and could therefore not appreciate her mother’s art form. “Isn’t that a tragedy about Beverly Sills’ daughter?” Bonnie offered the library patron standing above her. Without a moment’s hesitation, the patron responded “Oh, well, she’s Jewish, you know.” Stunned and silent, my friend Bonnie understood the possibilities of the patron’s perspective: To some Christians, Miss Sills would be seen as a “Christ killer” and justly punished with a child unable to hear. Bonnie said that she’d cried during the entire forty-five minute drive home to Norman, devastated by the encounter with a perspective that was hard to believe had survived into the mid-20th century. This happened about 1969. Well, its now the early 21st and I’m not certain things have improved all that much. This postcard reminded me that parts of the Agincourt story—large parts—remain to be told. The back of this card (which was never mailed) reads simply: “1907. 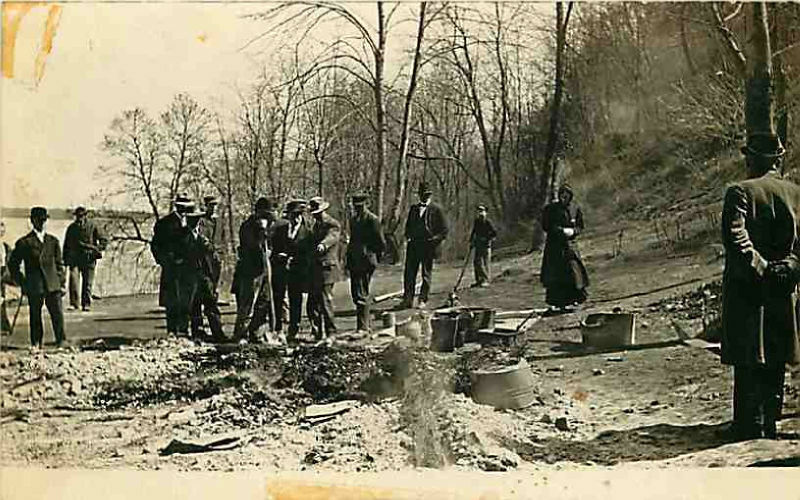 Family of 7 burned at Ponca.” Several questions come to mind, like Who would take such a picture and why? and What’s the story behind the fire? Ponca, Nebraska is a few miles northwest of Sioux City, near the bluffs of the Missouri River. That may, indeed, be the “Big Muddy” in the left distance. From the clothing shown, the weather seems chilly, but it certainly isn’t winter—at least like we know it here in North Dakota. Yet the family of seven might still have been victims of a poorly tended stove or fireplace. The ruins suggest a modest house, so how could the family not have escaped? Given the human condition and the fact that we can often be well below our personal best, what number of stories might grow from this deceptively simple artifact? At the 2007 opening of the exhibit, Mike Weiner (an M.D. at what was then St. Luke’s hospital) asked me if there was a temple in Agincourt, the presence of a measurable Jewish community. My enthusiastic “yes!” put me on the path to understanding cultural and ethnic minorities in the Midwest. Technically, as a Scotsman I’m part of one myself. You know: clans (the good kind), kilts, bagpipes and all that are part of tribal behavior. Paradoxically, both Presbyterianism and whiskey set the Scots apart from the rest of y’all. I began simply enough with the U.S. census for 1900. Census information differs considerably from one decade to the next; but religion has not been one of its questions. [Not until recent political rhetoric has religion mattered to anyone—but don’t hold your breath; the Supreme Court hasn’t spoken.] But there are other ways into the subject, like country of origin for emigrants, or language; speaking Hebrew would be a good sign of Jewishness. Of course, google also helps quite a bit, providing short narratives of the Jewish community in Des Moines and Sioux City. The distribution suggested by these two sources told me a temple in Agincourt was justified. For a Modernist temple circa 1953, I limited my palette to three or four architects, designers who produced some of the finest religious buildings of the inter-war years: Pietro Belluschi and Erich Mendelssohn came immediately to mind, but I also added Paul Schweikher and Burnham Hoyt, two mid-century modern favorites. Coincidentally, both Schweikher and Hoyt practiced in Denver and ought to be on the radar of any MCM aficionados out there. Though I’m associating Temple Emanu-El primarily with Mendelssohn, these others have surely had a hand in shaping my thought. I must admit to be more facile in design frames of reference between the Civil and First World wars. So expanding my comfort zone to the inter-war years is no bad thing. Since the project was situated in 1953, Erich Mendelssohn was the obvious choice, considering the creation of Israel just five years previous in 1948. Temples for Jewish worship present their own particular issues, exaggerations of problems also present in Christian churches. Chief among them is the matter of High Holy Days: For Christians, Christmas and Easter will have higher than average attendance and might require additional services. But the fluctuation in attendance between a normal sabbath and a day like Yom Kippur can be daunting. The question becomes one of 1) allowing those present on a normal service to feel comfortable, not swimming in an overly large fish tank, and 2) allowing those on a High Holy Day to feel that they’re not sitting in the lobby or vestibule. Oddly, some of my research on the Protestant Christian “Akron-Auditorium Plan” has been helpful in this non-Christian situation. The importance of liturgical orientation (or what Islam calls qibla) varies with the species of Judaism: Orthodox, Conservative and Reform. Agincourt’s community was likely to be somewhat liberal and open to non-liturgical placement of the sanctuary. The site itself was obvious: it would be adjacent to Church Block A-5, near Asbury United Methodist, sharing their parking and also connecting the temple—to be called Emmanu-El, from the Hebrew name עִמָּנוּאֵל (‘Immanu’el) meaning “God is with us”—with the religious denominations that had formed the core of Agincourt’s civic origins. The demographics of Iowa are working against the idea that Agincourt had a sufficiently large Jewish population to warrant a center for their community, let alone a resident rabbi. So the program would necessarily be simple and the budget limited: 1) a sanctuary; 2) a social hall; 3) space for religious and cultural education in the language and traditions of Judaism; 4) administrative and other support spaces. All of this had to be accommodated on two 50 by 140 foot residential lots. It was unlikely that the congregation could afford the luxury of a full-time resident rabbi. 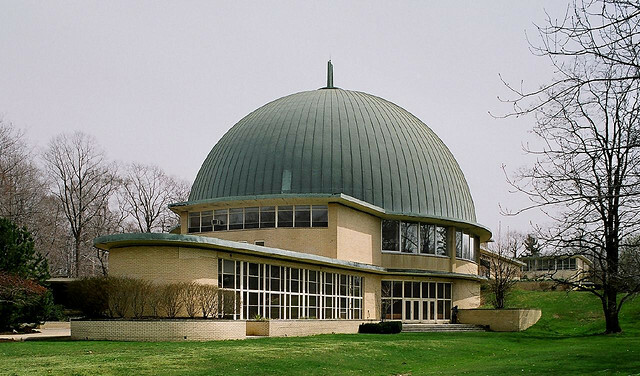 I’m anxious (in several meanings of the word) to show you what has evolved, particularly from my study of Mendelssohn’s three major American synagogues: St Louis (1946-1950), Cleveland (1947-1951) and Saint Paul (1950-1954). St Louis and St Paul are tantalizingly close to Agincourt, which gave me a wonderful opportunity to imagine him “in the neighborhood”. He died, by the way, in San Francisco, California in 1953.